25th April, Arlington, Texas: The last time Diandra Asbaty of Chicago reached the championship match of the United States Bowling Congress Queens, she bowled a match to forget. On Tuesday night, she bowled a match she will never forget. 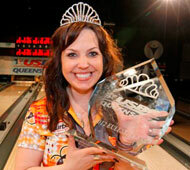 Asbaty defeated USBC Hall of Famer Carolyn Dorin-Ballard of Keller, Texas, 244-227, to win her first career major title at the 2012 USBC Queens presented by Storm. In 2007, Asbaty also advanced to the Queens final but lost to Kelly Kulick, 192-143. This time she would not be denied. Asbaty needed a strike and seven pins in the final frame and threw three perfect strikes to lock up the win at the International Training and Research Center. "I'm still in shock and literally feel like I'm in a dream," said Asbaty, a 14-time Team USA member. "It's every girl's dream to step in the 10th against a bowler like Carolyn and throw a strike to win. She was one of my idols growing up and really inspired me." Asbaty said the experience in 2007, when she lost as the Queens top seed, helped lead her to the moment she experienced Tuesday. "If I could take what happened in 2007 and change it, I still wouldn't do it," said Asbaty, who was the No. 3 seed in Tuesday's finals and picked up $20,000 for the win. "That moment and that heartbreak made this win possible." Dorin-Ballard, who earned $10,000 for finishing second, got at least nine pins down on every ball in the title match and struck seven times, but a 7 pin in the ninth and a 10 pin in the final frame opened the door for Asbaty, who tossed the final six strikes. "Am I disappointed, absolutely, but I put the ball in the pocket and you can't control what happens sometimes," said Dorin-Ballard, who won the Queens in 2001. "Now it's time to work a little harder and get ready for the U.S. Women's Open in June." In the semifinal, Asbaty took down second seed Stefanie Nation of Grand Prairie, Texas, 270-185. Asbaty closed with nine straight strikes as Nation failed to gain any traction in the match. Asbaty moved on in the night's second match by defeating Liz Johnson of Cheektowaga, N.Y., 233-191. Asbaty opened with four consecutive strikes and led by more than 20 pins the entire game. In the opening match of the night, Johnson started with a spare and six consecutive strikes as she built a 34-pin lead halfway through the game and went on to defeat Josie Earnest of Nashville, 268-223. A total of 131 of the top bowlers competed in the Queens, which featured a prize fund of $110,000. For more information on the USBC Queens, visit www.bowl.com/Queens. Story and photos by Lucas Wiseman, USBC.